Ryanair has said it is prepared to recognise pilot unions as it seeks to avoid strike disruption over the Christmas period. Earlier this week, 79 Dublin-based Ryanair pilots said they would strike for one day on 20 December. The airline was also facing action by pilots elsewhere in Europe. Ryanair has never recognised unions, but it said it would change this policy in order to avoid disruption to flights and passengers in Christmas week. It has written to pilot unions in Ireland, the UK, Germany, Italy, Spain and Portugal inviting them for talks. On Friday afternoon, Irish union Impact, which represents pilots, said it had "made contact with" Ryanair management after receiving a letter from the airline. "Impact has indicated its belief that an immediate meeting, between management and the union, is now necessary to clarify issues and make progress." The union said its officials were available "today or at any time over the coming weekend". However, they have not called off next week's strike action in Ireland. The UK pilots' union Balpa, which was not planning to strike next week, said it had written to Ryanair to accept the offer of talks. Media captionRyanair tells Today the airline is moving to recognise unions as it's "time for change"
The carrier said it would recognise unions "as the representative body for pilots in Ryanair in each of these countries, as long as they establish committees of Ryanair pilots to deal with Ryanair issues, as Ryanair will not engage with pilots who fly for competitor airlines in Ireland or elsewhere". 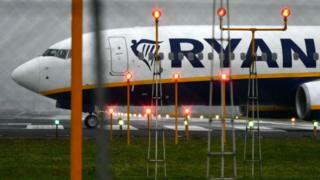 Ryanair chief operations officer Peter Bellew told the BBC there were "no strings" attached to the offer. "The basis of what we've asked to do is the same as other airlines do around the world and within Europe, so I don't believe there's any strings there." 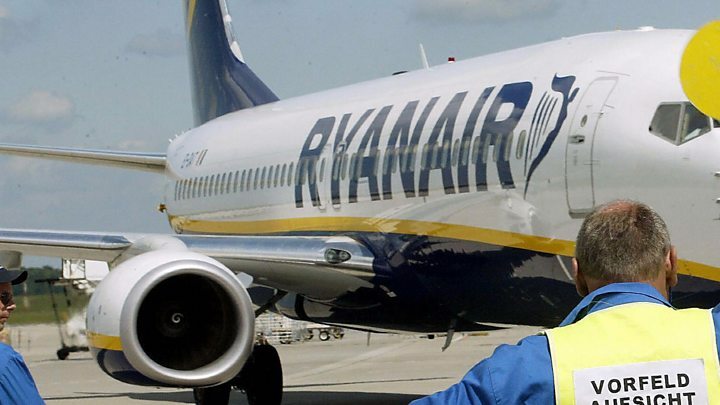 Ryanair called on the unions to cancel the planned strike on 20 December. However, Mr Bellew said the offer to hold talks about collective bargaining was not just about next week's planned strikes. "This is about the long term. We have 4,500 pilots working for Ryanair at the moment, great aviation professionals, we need to get a basis with them to work going forward. "We feel it's the best grounds to move forward with our workforce for the next 10/20 years where we intend to grow to be the biggest airline in the world." Ryanair's share price fell 8.6% after the invitation to talks became public, amid investors' fears that any change could push up costs. Mr Bellew said: "I think there might be some minor changes but I don't think it's going to be material in the overall cost of the company." Pilots in Italy had been due to strike on Friday for four hours, between 13:00 and 17:00 CET (12:00-16:00 GMT). However, following receipt of the letter from Ryanair, the main pilots' union, Anpac, said it had suspended its walkout. Chief executive Michael O'Leary admitted union recognition would be a "significant change" for the airline. "Christmas flights are very important to our customers and we wish to remove any worry or concern that they may be disrupted by pilot industrial action next week," he said. "If the best way to achieve this is to talk to our pilots through a recognised union process, then we are prepared to do so." In October, Mr O'Leary wrote to the Ryanair's pilots to offer them better pay and conditions after the airline was forced to cancel thousands of flights. At the time of the cancellations the airline admitted it had "messed up" the planning of its pilots' holidays. In his letter, Mr O'Leary also apologised for changes that caused disruptions to their rotas and urged them not to leave the airline. Aviation expert John Strickland of JLS Consulting said the idea of Ryanair recognising unions was "revolutionary" for the company. "I think the company realises they need to pay more, they recognise it's a labour group who they cannot do without, they cannot simply replace pilots off the street on a short-term basis. "There's a global pilot shortage and Ryanair is actually pretty well placed in the pecking order for pilot jobs but they have to make sure these people are on side and not inflame personal feelings with that part of the workforce," he added. Ryanair compensation info 'woefully short' says Which?